It’s time to set the record straight. For most middle income couples, Social Security in fact makes up 20% – 50% of their retirement income—often upwards of $500,000 in lifetime benefits. Obviously, that is a large sum of money for just about anyone. Doesn’t it make sense to maximize that asset if you can? With so much at stake, when and how to elect Social Security may be the most important decision middle income couples make in retirement. 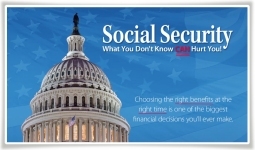 At Dave’s Social Security Workshops, all will learn important information on how Social Security calculates your benefit and offers you a lot of control on how and when to take it. So if your single, divorced, widowed or married you must attend! You will learn strategies to increase your benefits. All workshops are free and without obligation and all who attend will receive a copy of Dave’s new book entitled “How to Have a Stress-Free Retirement”. Click here to signup for a AAA Workshop Event. 255 Main St. Southington, CT 6:00p.m.-7:30p.m. 2750 Reservoir Ave. Trumbull, CT 6:00p.m.-7:30p.m. 10 Newton Rd. Woodbridge, CT 6:00p.m.-7:30p.m. 1720 Foxon Rd. North Branford 6:00p.m.-7:30p.m. For most for us Social Security is the only form of continuing income in retirement! There are many ways to claim Social Security benefits and the difference between them can be tens of thousands of dollars. To get a copy of your book, please send me an email from our Contact form. Are You Interested In A Stress-Free Retirement? E-Mail: Please use our Contact Us form.